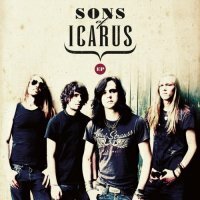 The blurb says Sons Of Icarus; “are all set to soar into rock’s heady stratosphere..”. It is a confident boast that befits the bullish attitude of a group of musicians still in their early 20’s. There is however no doubt the band have earned their growing reputation. Winners of Marshall Amplifiers ‘Ultimate band contest’ in 2010, and subsequent opening slots at Download and Sonisphere. Not to mention support slots with The Answer, The Black Spiders and Rival Sons. This already amounts to quite a C.V. So is all this attention warranted ?. Well, as soon as the infectious riff of opening track ‘You Want It All’ pumps out of the speakers it becomes clear these youngsters are something very special indeed. The mid paced track has a distinct Zep’ feel with Quilly’s pounding the drums like a pocket sized Bonzo, and Andy Masson’s vocals soaring to the heights, sounding eerily like a hybrid of Myles Kennedy and Wolfmothers Andrew Stockdale. This 7 minute epic flies by and musically is tighter than a ducks arse and with a confidence that belies their years. With the spiralling riff of ‘Not Myself’, a song that sits in Q.O.T.S.A territory, the band continue the momentum. The guitars of Steve Backwill are set firmly to ‘fuzz’, with some clean soloing to boot .The furious flurry of drums and Masson’s soaring vocals further enhancing the overall appeal. The band don’t let up with the frantic ‘Can’t Let Go’, for the first time bassist Alex Masson stepping up to the plate with a pulsing sound so low it rattles the bridge of your nose. By contrast the slow building ‘Sick To The Teeth’ sees the band with a sound that evokes a hazy journey slicing through the desert on a dusty highway. The band are happy to sit back and patiently lets Masson’s vocals take centre stage with a range that would make many a seasoned front-man envious. With such an impressive opening gambit I have no hesitation in filing Sons Of Icarus in my ‘ones to watch’ folder. I await their full debut album with much anticipation.